My 2x-great-grandfather was John Murray (b. 1823) of Milltown who married Catherine Rafferty (b. 1825) and had seven children. 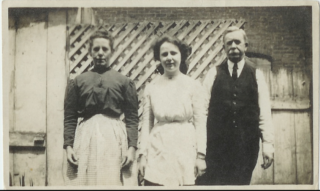 Of the seven, the oldest Bridget C. (“Biddie”) Murray (1848-1931) emigrated to Baltimore County in Maryland USA around 1865 and married by great-granduncle, Martin Connor (born Kilbride, Roscommon 1840) who arrived in Baltimore County in age 9 in 1849 with his parents and brother. Martin and Biddie sponsored Biddie’s younger sister Margaret (Maggie) Murray (1860-1932) to come over in 1878 and Maggie is living in their household as of the 1880. But Martin’s brother Michael (1851-1924, my great grandfather) soon made the most of this opportunity and married Maggie and my grandfather was born in 1890 in Timonium Maryland. Other Murray’s from Miltown in that Murray family also emigrated (but not all) to Washington D.C. and the families stayed very close in the U.S. meeting for annual family picnics. This page was added on 01/08/2017. Thank you for getting in touch. We appreciate and welcome information on families on our website.